On the east coast where I lived and grew up, there sits a barrier island off the coast of North Carolina known as the Outer Banks. Well known for taking the brunt of many east coast storms and hurricanes, it’s a beautiful place with wild horses and it has tons of charm, fantastic food and famous southern hospitality. For a half dozen years, we did the twelve-hour road trip from Northern New Jersey to the Outer Banks for our annual week-long family vacation to Corrolla, on the northern end of the island. To get there is not easy, there’s no connecting bridge from Virginia Beach, so you have to make a long, round loop inland before heading eastward, over the Wright Memorial bridge, then onto the Outer Banks. Of historical importance, Kitty Hawk is known for the Wright Brothers whom in 1902 solved the problem of powered and controlled flight. On the very site of their first flight is the Wright Brothers Memorial as a tribute to them. The National Park Service has a ranger station there with historical artifacts, a replica of the first flyer, markers and the rails where they launched the first flight and park rangers give regular talks at the visitors center. It’s well worth a visit to see this amazing place. I was not much of a photographer in 2006, only reserved for documenting family activities and life events, and cell phones did not have cameras that were any good. My camera of choice was a Canon Powershot Pro1. A pretty amazing point-and-shoot with a fast f/2.4 lens that happened to be an “L” red ring zoom lens affixed to it. A sweet camera, it had a whopping 8 megapixel sensor, which was large for it’s time. I wish I still had it, but unfortunately the zoom motor broke when I loaned it to my daughter and it was not repairable. I shot the panorama above with the Powershot Pro1 in 2006, using the auto-stitch pano feature. For a 2006 camera, not bad, but I certainly can do better shooting the pano manually if I shot it today. If you zoom in, you can our Jeep Cherokee Laredo on the beach! Since moving to the west coast last year, we’ve visited some wonderful beaches, but I miss the charm and beauty of the Outer Banks the most. Sorry LA, so far the outer banks has you beat in my book! 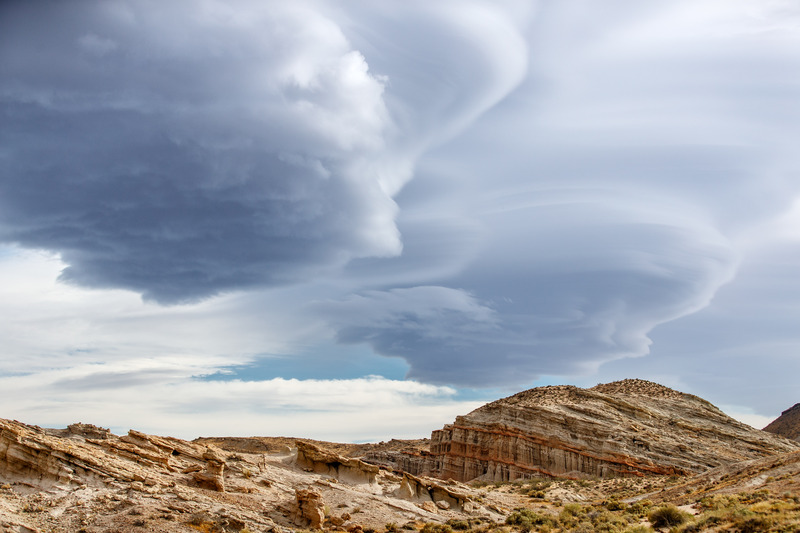 While driving home on California State Route 14 from Nevada, the winds began to gust and I noticed some unusual cloud formations. I was nearing Red Rocks Canyon State Park when I pulled over and took this shot. These are rare lenticular clouds, and yes, those iridescent purple hues are real. if you’ve never seen these clouds before, they are spectacular! I hope you get a chance to see them some day.